The Universities Superannuation Scheme’s (USS), one of the three largest UK pension schemes alongside the pension schemes of BT and Lloyds, went ahead with its proposed changes to employees’ pensions and cut expected pensions by 25%. Most of the USS’ current members had their pension linked to their final salary upon retiring, which has been replaced by an inflation indexing rule from 1 April 2016. The new scheme ignores career progression and other salary increases. This will lead to substantial wealth transfers from members of the final salary section to other USS members. Under the new rules, the option for final-salary members to receive a pension based on a future pensionable salary has been removed retroactively, which reduces the value of those members’ accrued benefits. Part of the expected loss for final-salary members is caused by freezing accrued pensions and linking them to increases in official pensions from the implementation date (1 April 2016). Consider the case of an early-career academic who, at age 34, earns a base salary of £43,000 and has been a member of the final salary section for 7 years. Assuming an inflation rate of 2.5% for the foreseeable future, her annual pension under the proposed rules would be £43,000 / 80 × 7 × 1.025(65−34) = £8089.40. If her salary remained constant and would only increase in line with inflation, this result would also be the outcome under the final salary scheme. Now consider the case of the same academic, who now expects to be promoted in the future or to receive other pay increases above the inflation rate. For example, rather than earning £43,000 in real terms until age 65, she can expect an average increase to £55,000. Her pension would then be £55,000 / 80 × 7 × 1.025(65−34) = £10,346.91. Under the proposed rules, her pension would be reduced by 1 − £8089.40 / £10,346.91 = 0.218, or 21.8%. The assumed inflation rate of 2.5% is immaterial to this calculation, as a calculation in real terms yields the same result, 1 − £43,000 / £55,000 = 0.218. In addition to this expected wealth loss due to ignoring expected salary increases, the member also loses the time value of the option of receiving a pension higher than the one based on her current salary due to random fluctuations in her salary. Even if she does not expect her salary to increase above inflation, future events may lead to random up and down movements of her salary. Since under the final-salary rules the pensionable salary operates like a ratchet mechanism, the member’s pension cannot be reduced by future events and can only increase. On average, this leads to an increased pension relative to the new scheme even if the final-salary member does not expect any pay increases. In summary, both expected and unexpected pay increases will cause wealth losses for final-salary members under the new benefit structure. Losses will be highest for members who have accrued some years of pensionable service but also expect future salary increases or are relatively far from the pension age. The USS needs to justify this reduction in the value of members’ accrued benefits. What does this mean for the USS? Current members of the final salary section give up part of their accrued benefit to maintain the future solvency of the system. Since other members of the USS do not take part in such reductions of their accrued pensions, the economic effect of the proposed rules is a wealth transfer from final-salary members to other active and inactive USS members and members currently receiving pensions from the USS. If the USS expects a solvency problem in the future, the risk of such a problem is being reduced at a cost for final-salary members caused by retroactive changes to their accrued pensions. The consultation document did not include an argument as to why this asymmetric treatment of different classes of USS members is justified. If the USS is underfunded, one might expect that all creditors of the USS take an equal cut. If this includes a retroactive reduction of final-salary members’ expected pension, it should also include reductions of pensions for other active and inactive members and members currently receiving pensions. Is there a right to future pension increases? The above analysis depends on whether a final-salary member is entitled to payments in respect of future pay increases through inflation or promotion. If members’ future pensions based on accrued benefits are not linked to future changes in pay due to inflation or promotion, the argument that the present value is reduced does not hold. Your pensionable salary is your highest average salary, worked out with a formula designed to give you the best possible calculation – ‘smoothing out’ any adverse ups and downs in your salary over the years, and making adjustments for price inflation. We calculate your annual salary for each period of 12 months, while you have been a USS member, over a maximum of 13 years prior to your retirement and revalue each salary, except the last 12 months, according to the movement in price inflation. your highest revalued salary averaged across any three consecutive years over the last 13 years. increased, except for the last year before the relevant date, in proportion to any increase in the RPI between that published at the last day of the relevant year and that published at the relevant date, but excluding any amount in respect of VT employment which is concurrent with eligible employment which is not VT employment and to which sub-rules 32.12 to 32.15 apply. If this can be construed as a mechanism that entitles members to future increases in their pensionable salary based on future increases in pay while they are a member of the USS, the net present value of their accrued benefits should include the value of this option to receive this higher pension. Consistent with this interpretation, the actuarial valuation of the fund’s liabilities in 2013 assumes an average salary growth of 4.3 per cent per year. One way to think about the wealth implications is to assume that the USS stops accepting new members and all existing and new members must sign up to a different scheme for any future pension contributions. The current USS will remain in existence but only to administer existing claims. What would be the value of the existing members’ accrued benefits? Since existing members will remain members of the “old” USS, they are subject to the final-salary rule stated in the Guide for members. The net present value of these members’ accrued benefits would then be determined by their future salary as long as they stay with the “old” USS. The rights of existing members are economically similar to those of the owners of inflation-linked bonds. Although the bond’s cash flow stream is not determined when the bond is floated, its value can still be estimated from expected inflation and interest rates. The value of accrued USS benefits is determined in much the same way, with the added complication that a pensionable salary can only increase and never decrease according to the final-salary rule. Similar to the issuer of an inflation-linked bond, who promises to pay a coupon in relation to inflation, the USS promises to pay a pension linked to inflation and pay increases. Continuing the analogy, the next step in pricing the inflation-linked bond would be to subtract the risk-weighted loss in case the issuer becomes insolvent. If USS memberships were tradable, their price would reflect the current expected underfunding of the scheme, which may lead to insolvency in the future. However, this consideration of bankruptcy risk is irrelevant for the cash flow rights of the buyer of the inflation-linked bond in the same way as it is irrelevant for the cash flow rights of a USS member relative to the USS. The actual economic value of USS accrued benefits will only be realised either through receiving the pension or through bankruptcy of the USS. The USS cannot unilaterally decide to reduce the cash flow rights (i.e., pension) promised in the year a contribution to the USS was made. The USS reducing the accrued rights is the same as a bond issuer deciding to reduce coupon payments. In the bond market, such a decision would most likely be considered a default and bond holders would ask for a restructuring of the issuer’s remaining liabilities. Similarly, USS members may need to restructure the liabilities of the USS, which would affect all USS creditors, including current members, deferred members and members currently receiving USS pensions. If the current economic value of all accrued cash flow rights is greater than the assets of the fund, these rights may need to be reduced for all creditors. 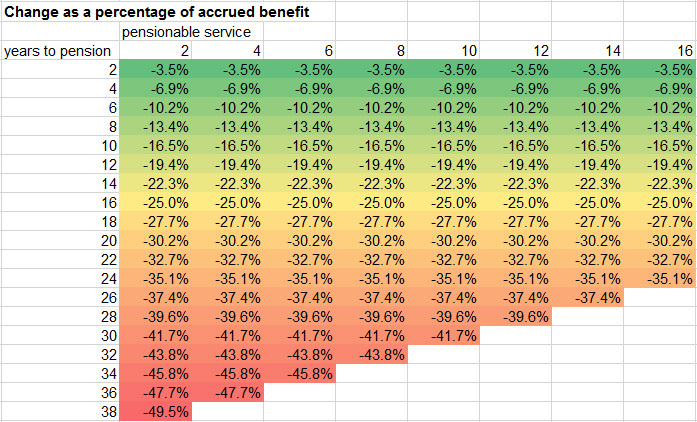 The following figure shows the percentage loss in accrued benefit as a function of pensionable service and years to retirement for a base salary of £40,000, assumed salary growth of 4.3% per year and inflation of 2.5% per year. The spreadsheet on which this calculation is based can be downloaded here.